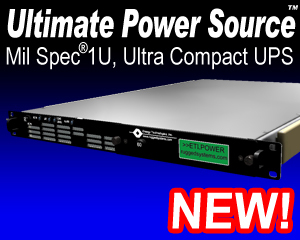 Built in: Power Conditioner/Frequency Converter/UPS/Generator. Additional fuel tank, providing additional runtime at full load. Auxiliary fuel inlets and fuel pump draw from external fuel sources for longer run times. Individual Load Control: local and/or remote via TTY or SNMP software. 28 VDC Input with NATO Slave connector for use with Military/Tactical Vehicles. Automatic Transfer Switch (ATS) automatically selects between external source or internal generator, allowing the	system	to operate from any in-country power source or external	generator. 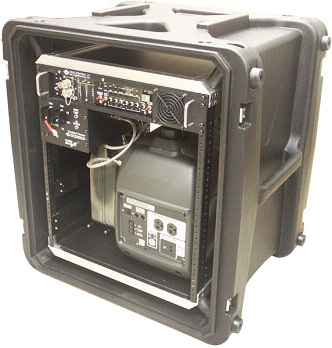 When the Tactical Power Plant (TPP) is configured to be fed from an external power grid, and that power is lost, the TPP will revert to UPS power and an alarm will sound signaling the end user to start the generator while the load continues to operate without interruption from the UPS batteries. When the external power returns, and remains stable for several minutes, the TPP automatically transitions to the grid source and will shut down the generator to conserve fuel. The same scenario is true for when operating from a 28 VDC source.